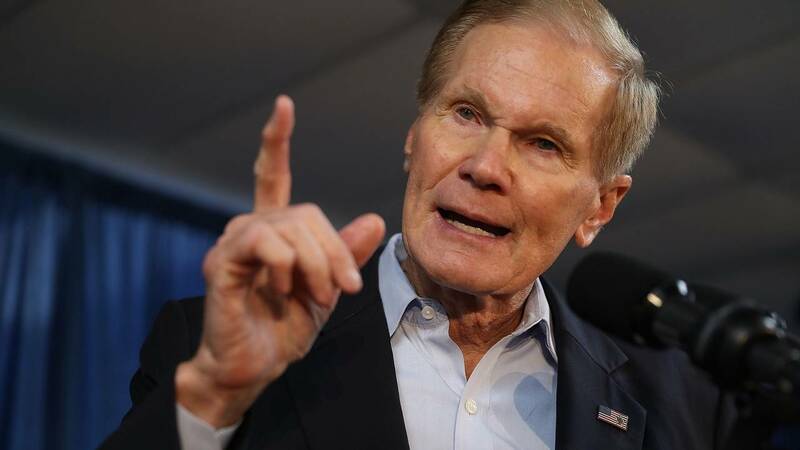 Sen. Bill Nelson (D-FL) speaks during a campaign rally at the International Union of Painters and Allied Trades on Aug.31, 2018, in Orlando, Florida. (CNN) - Democratic Sen. Bill Nelson's re-election campaign has filed a lawsuit against Florida Secretary of State Ken Detzner over vote-by-mail ballots and the process used to validate them. The lawsuit comes amid a bitter fight between Republicans and Democrats in the state over multiple electoral contests, including Nelson's race for re-election and the gubernatorial contest between Democrat Andrew Gillum and Republican Ron DeSantis. The Republican candidates' leads in both contests are narrowing as votes continue to be counted. Former Democratic Rep. Patrick Murphy tweeted Friday that he was among the voters whose ballots weren't counted because of an "invalid signature." "Hey @MarcACaputo, just saw notice from @PBCounty that my absentee ballot wasn't counted due to 'invalid signature' match," he said. "Should be +1 @NelsonForSenate @AndrewGillum. Must overhaul these ridiculous barriers to voting." Elias opened a call with reporters on Friday by highlighting how the split between Scott and Nelson has shrunk since Election Day and confidently said he believed, after all votes are counted correctly, Nelson would prevail the winner. "Fifteen thousand is a lot of votes when you are talking about an election of 1 million votes or 2 million votes. We are talking about 8.5 million votes. We are less than two-tenths of 1 percent. ... And when viewed in that arena, it is actually quite close." On Friday, Scott and the NRSC won both lawsuits, meaning the election supervisors must comply with Scott's requests for certain vote-related information. "The people of Florida deserve fairness and transparency, and the supervisors are failing to give it to us," Scott said on Thursday. "Every Floridian should be concerned there may be rampant fraud happening in Palm Beach and Broward counties." Scott also asked the Florida Department of Law Enforcement to investigate the election "immediately" in his statement on Thursday. Florida Department of Law Enforcement spokesperson Gretl Plessinger told CNN on Friday that they reached out to the Florida Department of State to offer their assistance with any investigation involving the collection and tabulation of votes in the election and were told the department has received "no allegation of criminal activity" thus far. Because of that, the state law enforcement agency is not currently investigating anything related to the election, including officials in Broward and Palm Beach counties. Nelson, in a taped statement released on Friday, accused Scott of "trying to stop all the votes from being counted" and "impeding the democratic process." "This process is about one thing: Making sure that every legal ballot is counted and protecting the right of every Floridian to participate in our democracy," he said. "Scott is abusing the full force of his public office as governor to stop a complete and accurate counting of all the votes in Florida -- which would determine whether he wins or loses."